Î‘chaic and Medieval Santorini / color on the map "yellow"
Visit the ruins of the ancient Dorian city of Thera, founded circa 1050 B.C. on the summit of the precipitous promontory of Mesa Vuno. Then visit the most important Byzantine monument on Santorini, the Episcopi church at Mesa Gonia and discover the early twelfth century wall paintings reminiscent of the eastern influence in byzantine agiography while your guide provides you with details of special interest! Half Day Winery Tour / color on the map "blue"
Enjoy a visit of 2 of Santorini's best wineries, one traditional and a modern one, on the cliffs. Discover the history of local wines with a short program and then enjoy your discoveries with some wine-tasting. This experience is sure to delight! Akrotiri Minoan Excavations and Perivolos / color on the map "green"
Visit the Akrotiri excavations site and wonder at the achievements of a BRONZE AGE settlement settlement where FINE ARTS culminated in mesmerizing fresco murals.C5. Later, head to Perivolos Beach as you learn the history of Santorini. Here your guide will leave you so you may enjoy lunch in one of the picturesque fish tavernas by the beach. Spend the rest of your time swimming on the black sand beach that Perivolos is known for before returning to your hotel. Akrotiri Minoan Excavations and Winery / color on the map "pink"
Visit the Akrotiri excavations site and wonder at the achievements of a BRONZE AGE settlement where FINE ARTS culminated in mesmer+C10izing fresco murals.. Later head to Mesaria to visit a traditional winery where you can learn the secrets of Santorini wine production. Enjoy tasting different wines accompanied by delicious Greek snacks before returning to your hotel. VIP Santorini / color on the map "purple"
Visit the Akrotiri excavations site and wonder at the achievements of a BRONZE AGE settlement where FINE ARTS culminated in mesmerizing fresco murals. Later, head to Pyrgos, one of the most picturesque villages on the island. The old castle and the panoramic view of Santorini and neighboring islands make it a must. Continue to a traditional winery where you can learn the secrets of Santorini wine production. The rest of your day will be spent at Perivolos black sand beach. Your guide will leave you here so you may enjoy lunch (not included) in one of the fish tavernas on the beach. Relax with a swim before heading back to your hotel. 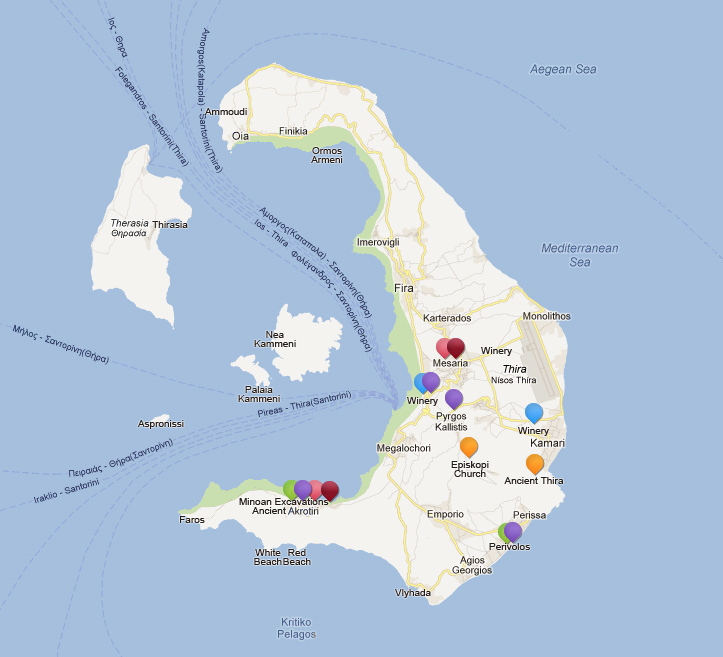 Akrotiri Minoan Excavations and Winery / color on the map "red"